PITTSBURGH — Through two starts this season, Pirates left-hander Steven Brault has done pretty much all the club could have asked for out of a last-minute spot starter. Brault worked out all spring as a starting pitcher, but was pretty sure that he was going to end up in the bullpen this year, and that’s what happened — for all of one outing. Now back in the rotation due to Joe Musgrove’s shoulder strain, Brault has made two starts, gone five innings in both of them, has allowed five runs (4.50 ERA) and the Pirates have been in position to win both games, the second of which after Brault battled Cubs veteran lefty Jon Lester to a draw on Wednesday before the bullpen imploded. 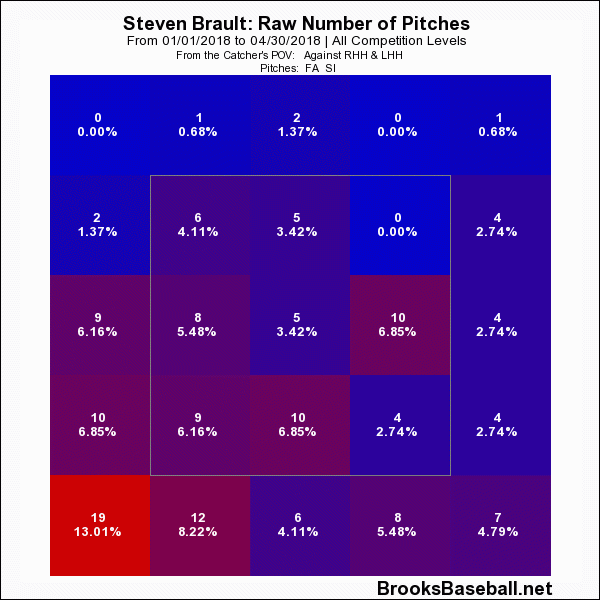 For Brault, that hasn’t happened a whole lot with his primary offerings, as his two-seamer (.230 batting-average against) and four-seamer (.190) have both been tough to hit. If there’s been an issue, it’s that he hasn’t been in the strike zone enough with those pitches. 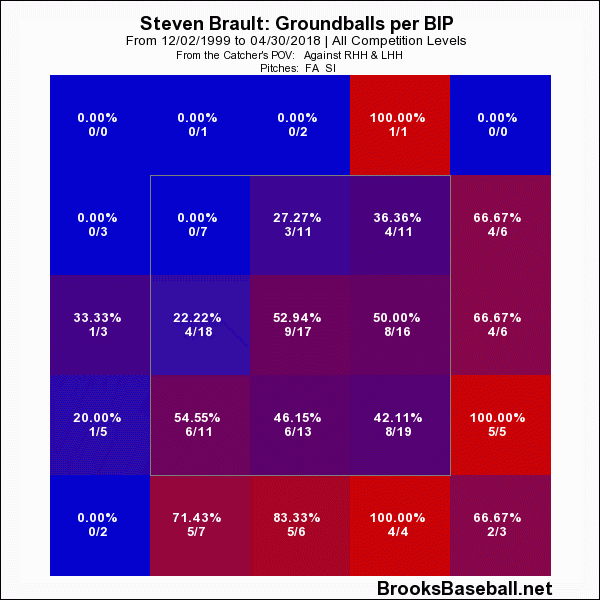 Brault currently has a 12.3 percent walk rate, which would be his highest figure for a full season at any level. With him throwing one of his two fastballs about 65 percent of the time, I took a look at his fastball command to see if there’s been a change. His hot spot has moved to low and inside on right-handers and low and away on left-handers. But when you look at where Brault gets his swings and misses, which is the most desirable outcome, it usually comes when his fastballs are out of the zone high. When he gives up ground balls, the second most desirable outcome, it’s usually on pitches low and away to right handers and inside to lefties. 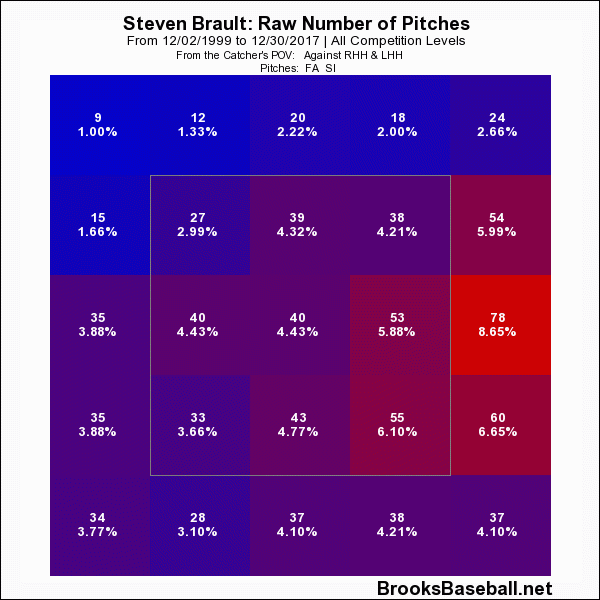 Brault hasn’t been hit particularly hard yet, so it doesn’t seem that the change in location has made him more hittable, but it does seem that he’s living off the plate in a place that’s much less likely to result in either a strike or soft contact. He has been able to minimize damage after giving up walks, something he said he was happy about. 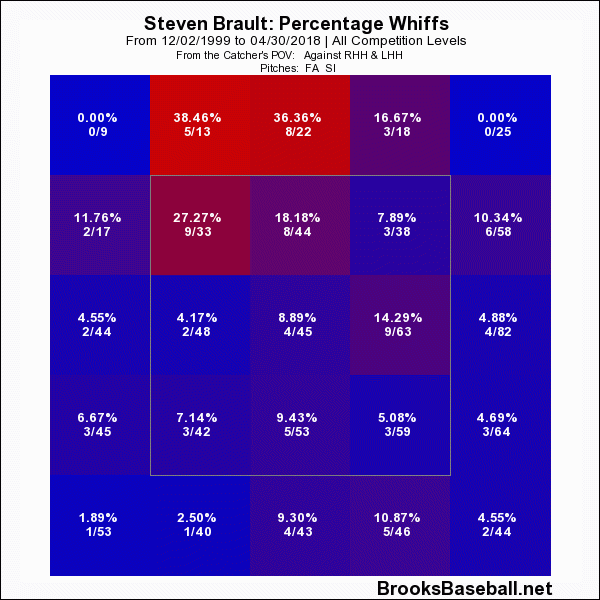 But Brault has shown through the minors to be able to have pretty precise command. It seems as if this is more of an intentional change in strategy that’s resulting in more walks than it is wildness. If that’s the case, it should be correctable. That’s a good thing for Brault, because outside of the walks, most of this numbers look pretty good. His strikeouts are up from his 2017 numbers, his home runs are down, as are his batting average against and his WHIP. His ERA- is 92 — pretty good for a No. 5 starter. That’s a good thing for Brault, because that’s exactly what he wants to be. The last hurdle for Brault will be extending and getting deeper into games. He hadn’t thrown more than 4-plus innings before his first start of the year, so he hasn’t been fully stretched out yet, but at some point, if he’s going to stay in the rotation, he’ll have to go deeper than five innings. But Brault’s path through the bullpen to the majors — unusual for some but apparently the Pirates new preferred modus operandi — has helped prepare him for that process. The Pirates haven’t announced their rotation for the home series against Colorado that starts next week. Brault’s turn will come back around on Monday in the first game of that series. Musgrove still hasn’t begun to throw, so he remains at least a couple weeks away from a return.